One of the most frequent jobs ACME Powerwash is hired for is to strip old, failing sealer from paver surfaces. Our 15+ years of experience have helped us develop a system for adequately stripping off old sealer. First, our technicians treat the pavers with a commercial-grade stripper. Then we use large, industrial surface cleaners with nozzles spinning at 2500 rpms that spray out steam and hot water up to 300°F and 3500 psi. Another technician follows behind with a standard power washing wand to rinse everything down and cut in any areas inaccessible to the surface cleaners. The surface is allowed to dry and the process is repeated until all stripper is removed from the pavers. 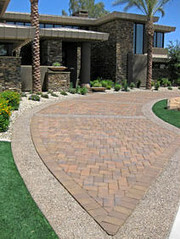 The last step for any paver restoration project is to apply a new coat of industrial-grade sealer. The sealer protects the pavers from stains and fading while bringing out the colors and enhancing the appearance of the overall property. Visit this paver cleaning and sealing website to learn more about cleaning and sealing your pavers and to see some more photos of recently cleaned projects. 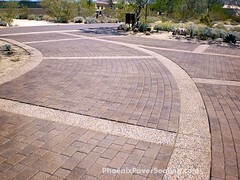 Technicians have been busy cleaning and sealing pavers in Scottsdale, Arizona. We have successfully pressure washed over 10,000 square feet of pavers in the last 10 days. The clean pavers get a coat of commercial grade sealer that enhances the paver surface. The sealer really makes the colors pop and also protects the pavers from stains, spills, and even harmful UV rays that can bleach out paver colors. Sealed pavers are also easier to keep clean, minimizing maintenance efforts around your residential or commercial property. 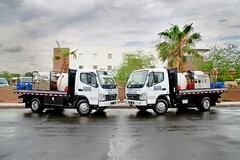 We maintain pavers for several commercial customers in Scottsdale and Phoenix, steam-cleaning them on a quarterly or semi-annual basis using our industrial pressure washers. For more information about pressure washing your pavers or to get a free estimate for paver sealing services, call (6o2) 373-1515 or visit our paver seal website. Is Your Commercial Property Ready? The Waste Management Phoenix Open is in Scottsdale this week and nearly 500,000 fans could be traveling to and from Scottsdale in the next 6 or 7 days to attend this world famous event. Is your commercial property looking its best? We are available for last minute cleanings with one of our 7 industrial, high-pressure steam-cleaning rigs. 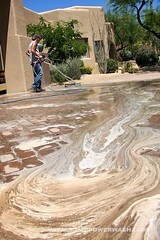 Call anytime for a free pressure washing estimate — 602-373-1515! Fall is the perfect time to seal concrete, pavers, and stone around your property. We have several different industrial sealers for a variety of applications including pavers, travertine tile, flagstone, concrete, exposed aggregate, slate, etc. Odds are that we have a sealer to match your needs. From natural-finish, penetrating sealers to high-gloss, “wet look” sealers, we’ve got you covered! FREE ESTIMATES! 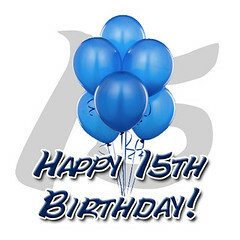 Call 602-373-1515 today for your free estimate. We love referrals! Be sure to ask about special programs for referring your friends and neighbors! We steam cleaned and power washed this driveway in Queen Creek before sealing it with an industrial, wet-look sealer. The driveway is now protected from stains and is much easier to keep clean. See what this tile looked like before we sealed it at http://www.PhoenixPaverSealing.com. This is a flagstone patio/pool area after cleaning and sealing with an industrial sealer. 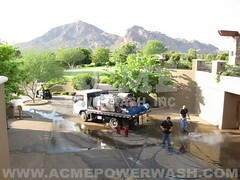 ACME Powerwash is a professional company with over 14 years experience in cleaning and sealing many different surfaces in locations all across Arizona. Have the recent thunderstorms left you with a HUGE mess? Our mobile power washing crews can clean up all kinds of mud, dirt, and debris that resulted from the thunderstorms that thrashed through the valley this week. We steam-clean concrete, pavers, asphalt, stone, stucco, and building exteriors to remove tough stains and debris. Call (602) 373-1515 to schedule a cleaning or get a free estimate! 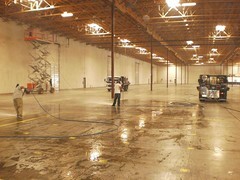 Power washing is a great way to clean up a vacant warehouse. Industrial pressure washers can generate steam and hot water at 300° and 3500 psi to blast away various stains, dirt, and debris. This warehouse in South Phoenix had black tire marks from forklifts, oil & grease stains, and plenty of dirt and spiderwebs on the walls. Four industrial power washers were used to clean all concrete surfaces and the the walls of the warehouse. A scissor lift was used to reach the higher portions of the walls. Big or small projects, power washing may be the cleaning solution you need. Get a free estimate — (602) 373-1515.